While official word is still lacking from Pelikan, it is not entirely surprising that this is the shade for 2017. Pelikan has held a few contest since 2015 which have provided the opportunity for fans to try their hand at crafting an IOTY. When Amethyst won as the 2015 ink, it was reported that Smoky Quartz, submitted by a participant in Poland, finished second. It was speculated that we would see Smoky Quartz as the 2016 release but that never came to pass with Aquamarine coming instead. It now seems Pelikan delayed rather than abandoned this color. You might also recall that we already have next years release mapped out, a yet to be named olive-green color which won Pelikan’s most recent contest. This years hue appears to be a light brown. The actual gem stone has a variety of colors ranging from almost complete transparency to a brownish-gray crystal. No writing samples are available just yet so only time will tell what this will actually look like on paper so it’s best to withhold judgement for now. 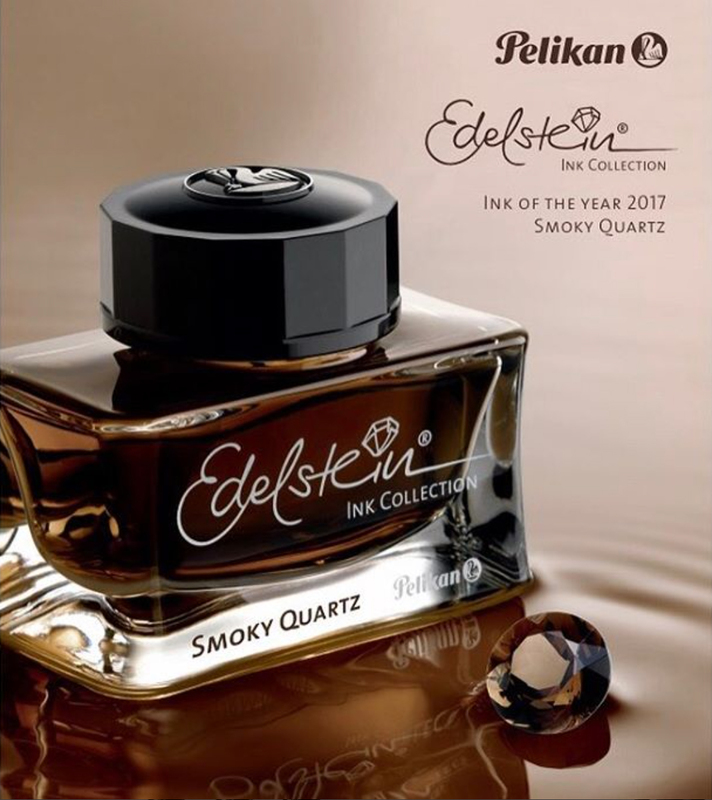 This is the sixth annual release of an “Ink of the Year” and presumably the third that Pelikan took inspiration from its fans to help craft. Smoky Quartz now joins the discontinued Turmaline, Amber, Garnet, Amethyst, and Aquamarine. All of the colors in the line can be traced back to gemstones (the German word Edelstein translates into gemstone). The Ink of the Year releases are limited runs produced only for one year at a time. If you’re a fan of a color, stock up because once they are gone, no more will be produced. Based on past releases, we can presume that Smoky Quartz will be available in 50 mL bottles as well as standard international cartridges. Look for availability sometime in the Spring. Finally, if Pelikan continues the trend of the last two years, we can expect to see an M205 demonstrator emulating this same color which I’m particularly excited about. This looks like a good one. Might even go well with my M200 Cognac….. This sounds interesting to me, I’m partial to more organic, earth tones. Could go either way with me. The truth will be in the swab. Thanks again Joshua. This one looks very fine and I do hope there is a 205 to go with it. I’ll add this one and its pen for sure (second and third bottles depending on writing first, of course). The prospect of the pen has me much more excited than the ink. This looks fascinating! As you say, the truth will be in the swab, but I’m feeling optimistic. I’m interested to see how the Edelstein Smoky Quartz will compare to the 4001 Brilliant Brown as well. i would so enjoy this ink of the year. Definitely worth trying if you like browns.